Caught in the hamster wheel of a stock broking agency, your every day is a heady mix of high stakes decision making under pressure. Presented with profit targets by a boss who has no hesitation to sack you, you’ll need to engage in panic sales and timed events, lobby society groups to influence the stock market, and even undertake all-out majority share acquisitions. Read the news to see the signs, or dabble with some insider trading to get the upper edge. But, be warned, a financial investigation into your company has begun, and you may well become the focus. 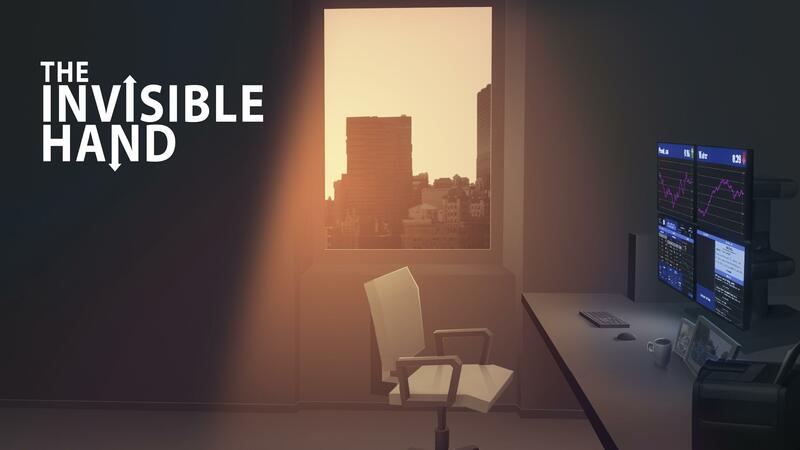 In a trip through the politics of work and money, The Invisible Hand explores the way we value things in a stock market driven dystopia that will have you reaching for your tenth coffee before the working day is done. Our main inspiration is Papers Please, which is great at showing the impact that bureaucracy has on people's lives. 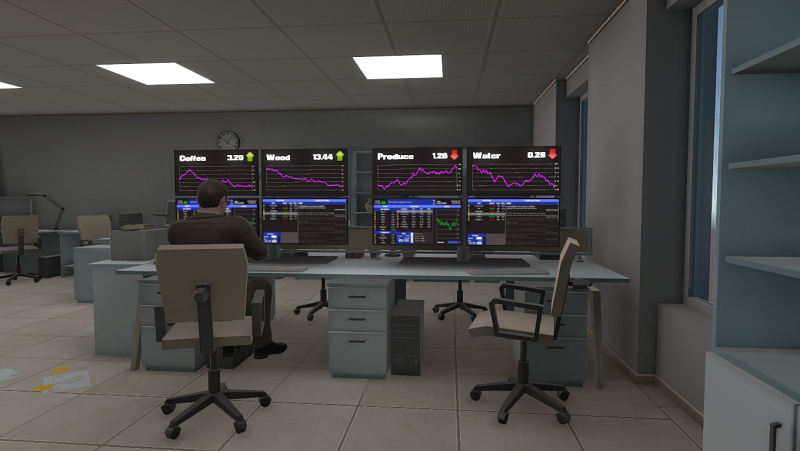 It gave us the idea explore that theme in the financial world, as well as part of the "daily" gameplay loop. We also want to get a feeling close to The Stanley Parable in the general atmosphere and the dialogues. The game is being developed part-time. We're always looking for feedback! If you're interested, let us know in a private message and we'll send the current build your way. We plan to release the game at some point in spacetime. This plot reminds me of Oiligarchy (http://armorgames.com/play/2607/oiligarchy), do you relate ? Thanks for the support! I didn't play Oiligarchy, but it sure looks like a good inspiration for what we are trying to do. Nevertheless it feels like the moral part in this game (crooked politics) is too obvious, we are trying make something more subtle, where the game makes you act wrong, without you realizing it. We hope to achieve this by not directly integrating politics as a part of gameplay, but more as a consequence of the player's doings. I don't know how to make that fit with the current gameplay, but it could add a really cool layer. You guessed right :p We are working on a coffe machine that will sit close to the player. 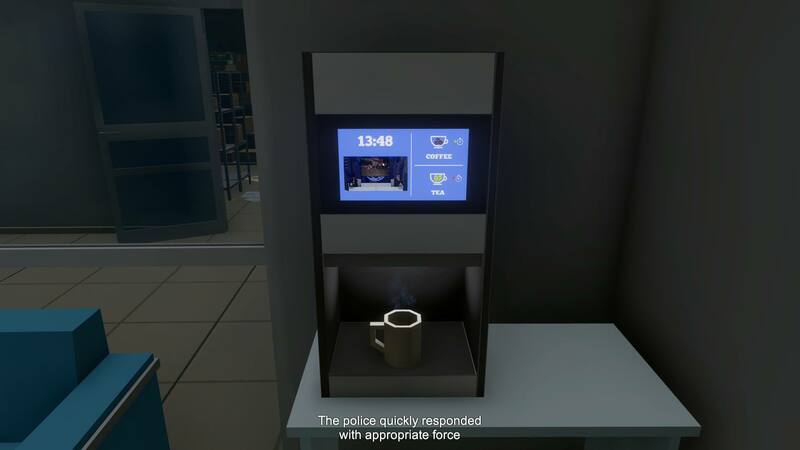 We also want to introduce VR capability for the game, but we are not sure how to get it right and the coffe machine would be a good step. The game will stay playable without VR anyway. So after the holiday break here is an update on what we are working on. Where is that coffee machine again? You can notice there have been some UI improvements, and it is not over yet. 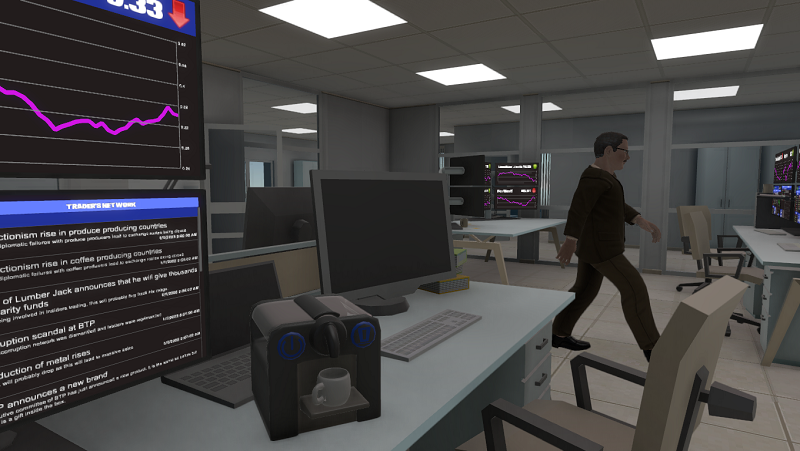 We are currently working on finalizing gameplay/UI features for the demo, as well as implementing "world" features such as events happening in the office, and post-processes related to player's mental state. Weekend mean free time. Free time means rendering time. We spent some time on the sun, and it looks pretty good. We made this using variations in the color and intensity of the Sun, as well as the color of the skybox. The scene is lighted with emissive lamps in the ceiling, and the sun adds dynamic lighting to the scene. We are working on shaders for our characters and models, but it feels like work on rendering is very time consuming, development wise, for a 2 devs team. We have been putting some thoughts in the tutorial for this game. The gameplay being quite complex, and an important vector of the story, we want to think through our tutorial so players have no trouble understanding the game, and get a glimpse of the story. To sum it up, we want a tutorial experience that does not feel forced, that is a part of the narration, and that doesn't interrupt the player (too much). 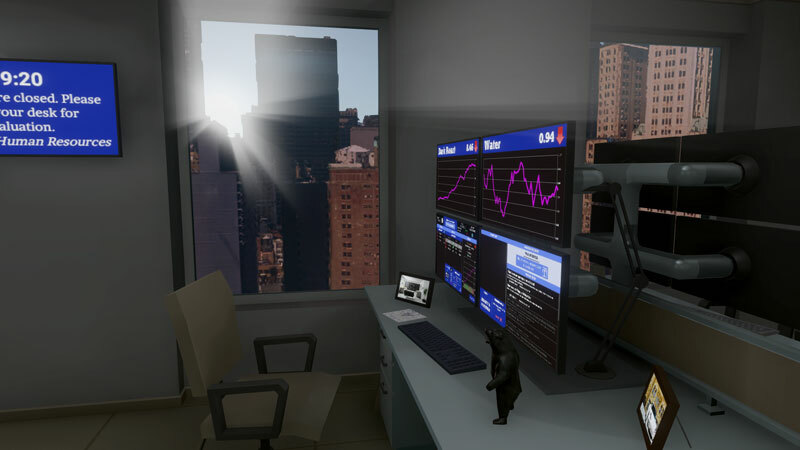 One of our goals is for the surroundings of the player to give lots of informations through curves, text or buttons, as in a real-life trading office, while trying to stage the scene to give incentives to the player on which feaures he should use. This would allow for a tutorial that doesn't babysit the player, and has a good flow without using blocking popups. 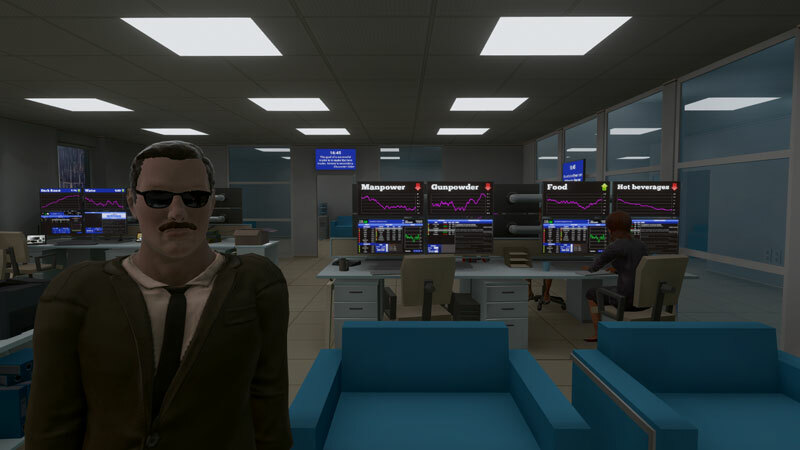 We will use different staging elements, such as the boss coming to your desk to welcome you in the company, phone calls at your desk, and customized events in the game's economy. Each element will learn one or two correlated mechanics to the player, and will dynamically respond to the player's action/absence of action. 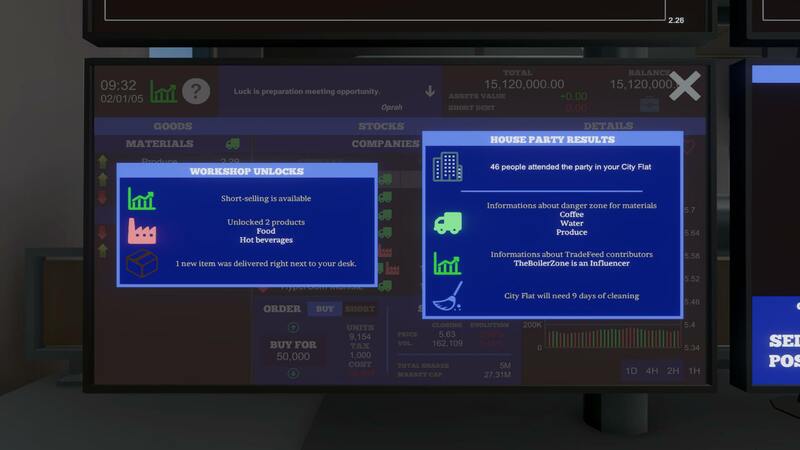 As some player might just not read through dynamic events during the tutorial, we are including a Tips Panel in the in-game UI that will often show tips on how the virtual economy works. I joined a flourishing game devs community ! It's called Tigris, and you can join us on Discord or Skype ! We can show a pre-alpha WebGL build of the game (playable in browser) if someone shows interest, send a PM ! Hey everyone ! Long time no see. We have been working a lot on our scene, so I thought I'd drop some screenshots around here. For the next few weeks we will be focusing on core gameplay. 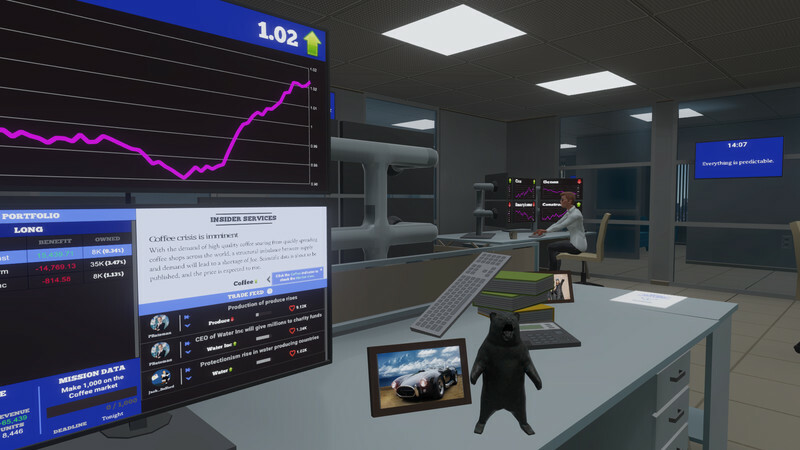 We got feedback from some people on what worked well and what didn't, so we are currently making changes to the virtual economy and the actual gameplay through the in-game UI. Feel free to give your thoughts and feedback ! We need those ! How deep are you gonna go on the implications of your actions? And will there be the opportunity to be 'good' rather than just not evil, like can you sabotage your company or take steps to cause economic power shifts? How deep are you gonna go on the implications of your actions? The player will experience implications of his actions through our social troubles system. Here we see that there has been Inflation and Shortages during the day. Inflation for Houses means that Materials to make a house got so expensive that houses are now more expensive for the consumer. We are working on other systems that will go along the social troubles system : the Police (that you can see on the gif above) will repress social troubles, and their effectiveness depends on the value of what they need : Vehicles, Manpower and Weapons. We also will introduce Unions, that will provoke strikes in companies if there are too many social troubles and if police is a little too... effective. The player will be able to directly influence the raw Materials' prices, through a lobby system we will soon implement on the main UI. This will allow him to have a direct and subtle approach to dealing with those social systems. In the meantime, while making sure that people are happy (or creating a revolution on purpose as he will be able to :p), the player will also have to fill financial objectives given by the boss. So maybe if he wants to fill those objectives fast, he will create some social troubles in the process. Or maybe he will go with a more balanced approach to make sure people do not get too angry. Or maybe he will just ignore those objectives because of his ethics and see what happens. We do not want social troubles to appear as the lose-state of the game, they are just a system to play with and that the player can master to fit his play-style. And will there be the opportunity to be 'good' rather than just not evil, like can you sabotage your company or take steps to cause economic power shifts? We have some other ideas, including letting the player spend some of his salary money on charitable organizations to improve social conditions, or making the boss give social objectives rather than financial ones, but this is not implemented yet, and we have some more thinking to do about this, see what works and what feels forced. It might be interesting to show what happens before the riots; extreme poverty, police brutality etc. Yes definitely ! We still have so much work to do, but scenario and atmosphere will be a priority once core gameplay is ready. You all can read our interview on ReviewFix.com if you want some more details on the game and our team ! - Balancing the economy according to the the pace of the game. 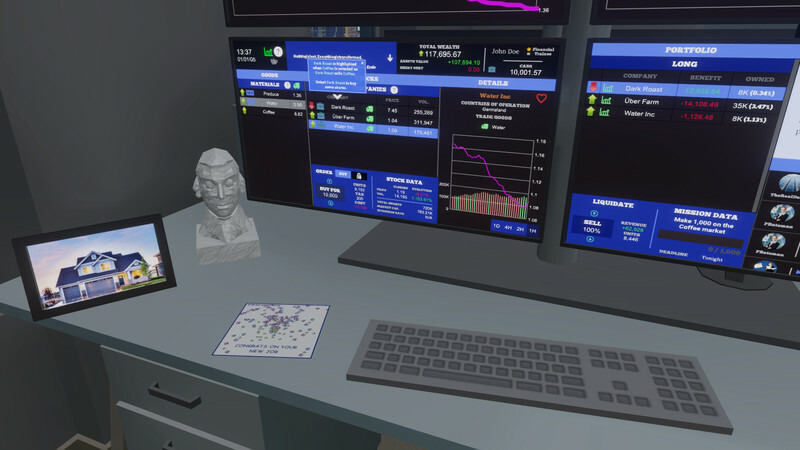 This involved a lot of playtesting, seeing how players discover the game and how they take advantage of what they learn to understand about the virtual economy. 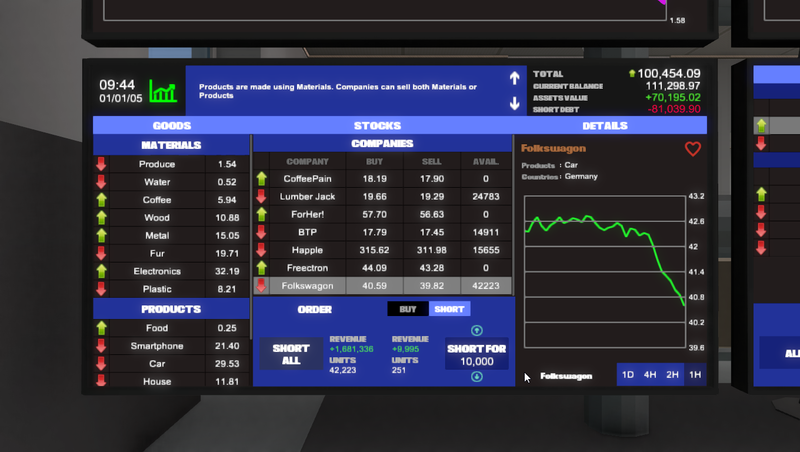 - Making a new UI for buying and selling stocks, which gives more information and easier control. We will also soon release a pre-alpha build showcasing the core gameplay and some scenario elements. Hey, long time no see ! We've been working on some animations and core gameplay features. With this addition, the trading gameplay is at its beta stage for the demo, and we will soon start to work on the tutorial sequence. Work left on gameplay will be to add rewards and things to do with your money between the trading hours. Once again, it's been a while, but this time we've got something big to announce. Here is a little riddle about it. Follow us on our new twitter account @KolkhozeGames for the details. Hey, here is a little something to wait a bit before the big announcement : we integrated AlienFX to Unity ! For this to work, you need LightFX.dll installed on your computer. You can get it with Alienware Command Center. Consider importing it in Unity if you have problems. AlienWrapper class handles the link with the DLL. Only basic functionnalities are available right now. AlienFX is a MonoBehaviour, which you can attach to any object and it will start a Coroutine that makes the light from blue to red as in the video. Hope it works on your side ! Hey there ! It's been ages since my last post, and a lot has happened ! First and foremost, we are now working with the awesome team at Surprise Attack Games, which are helping us set up some presence for the game. Thanks to them we were able to attend Gamescom and Paris Games Week these last month, which were amazing ! Seeing so much different type of players play the game helped tremendously with upgrading and polishing the core gameplay, which is now mostly done. The game evolved a lot in terms of look and feel, which you can see as I updated the first post with recent screenshots. 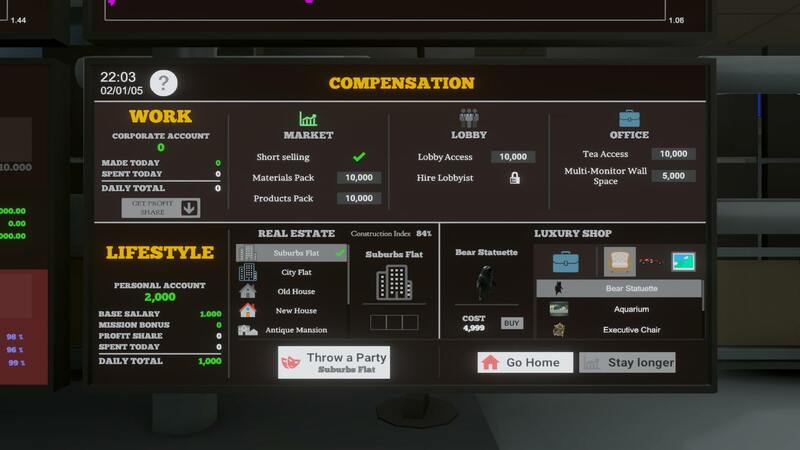 There is now an upgrade system for work, to unlock access to new trading values and features, as well as a real estate and luxury shops. You can store luxury items in your properties, and organize parties in them ! Parties allow you to do some networking, and gain access to useful informations about the market. The machine can either make coffee, which speeds up time, or tea, that slows down time. The player can use it to fit his playstyle, either by trading on safe bets, taking a coffee and let the money flow, or in a more instantaneous way, taking a tea to have a better reaction window. It also serves as a media feed, so you can find discover informations while waiting for your brew. 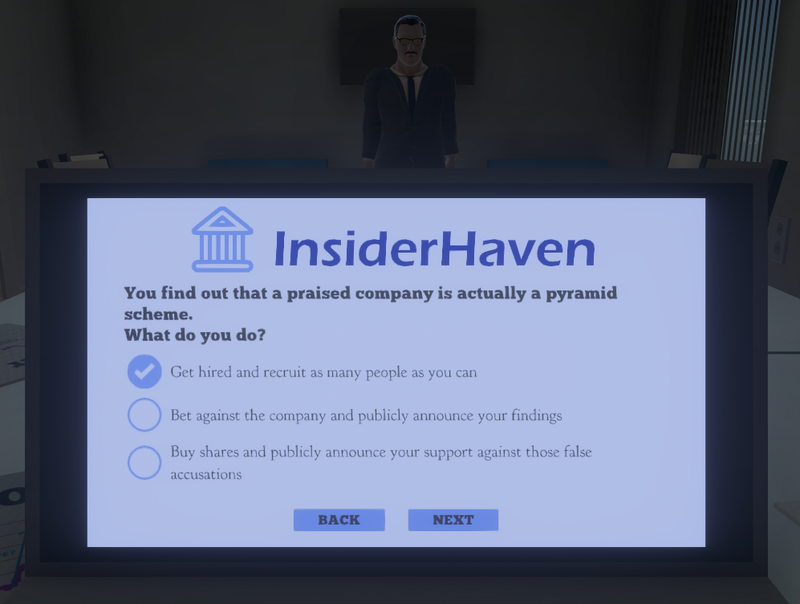 I've been told quite a few times that the game lacked an introduction, so I've been working on this job interview thing ! We're currently getting as much as possible done before July, at which point we will run out of budget and development will have to slow down. We want to take the time it needs to put all the cool stuff in so we're not planning release yet. The game is changing really fast and we don't have much time to update the log as much as we'd like, but let us know if you want to try out latest features ! Hope you like it comrades ! Hey there! As usual, it's been a while and a lot has happened. Good news first, we now have a Steam page! You'll find our first teaser video and latest screenshots there. The first post has also been updated with these. 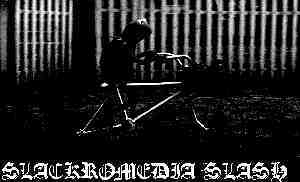 Wishlist it to stay updated and help us get more visibility. 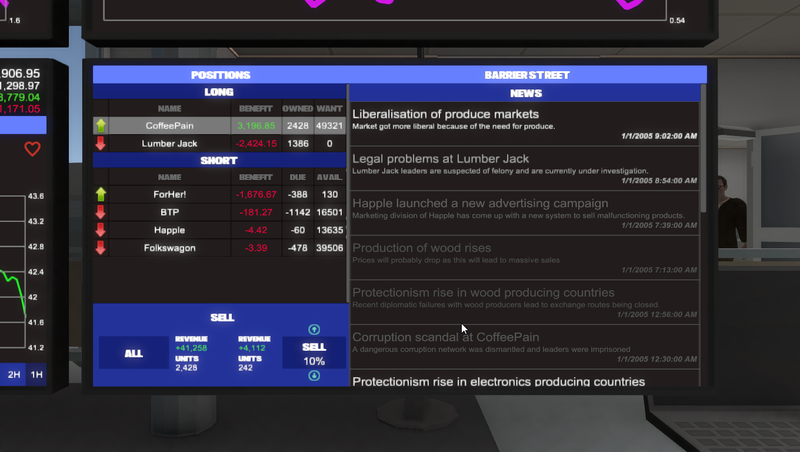 Now for the bad news, development is slowed down right now due to financing issues (ironic I know), but we're still devoted to bringing our capitalist dystopia to your screens, you'll just have to wait for it for a little while longer. Here's a sneak peek on what's done and what's in the schedule. Don't they all look happy to be here? Coworkers play an important part in the narrative and gameplay, and they now have more thoughts to share and dubious hint to dispense. We use Adobe Fuse CC to create them, which makes importing and animating them in Unity relatively easy. We still have to use custom import scripts to install all our character modules, such as the Dialogue module which has been improved a lot lately. 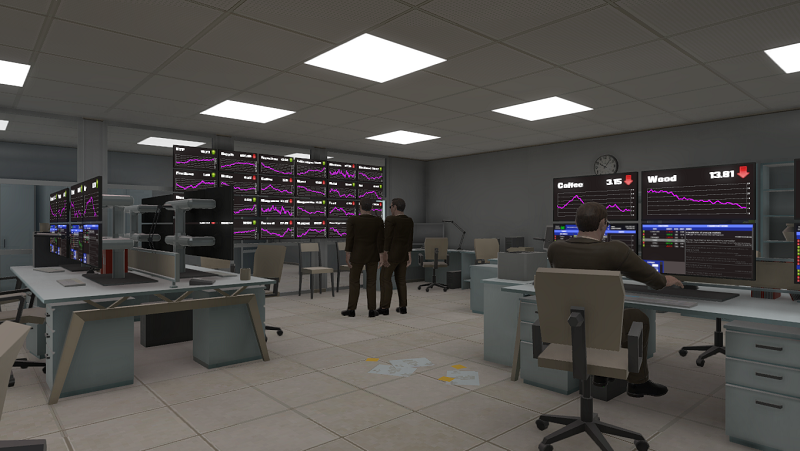 Fitting the stock market/player information/interactions we need on player screens in an ergonomic, functional and aesthetic way is one of our greatest challenges for the development of the game. The market gameplay was subject to a lot of improvements and new features in the last months, and now that it’s in an almost final state we’re still polishing the UI to improve the user experience. Stay tuned as we’ll have things to show in the coming months! The other significant challenge we are facing is player immersion. We’ve had a lot of feedback where players didn’t feel they were making a difference in the game’s world through trading. As of now, most of our narrative triggers for the player’s action are long term and subtle, and we are going to work on delivering real time narrative elements reacting to how you play the markets. We already have some ideas, but that’s an area where feedback is very important, so as usual if you want to try the game in its current state or if you want to contribute let us know!